Location: 1 North Broad Street. Hours: Tours mandatory, no tours on Sundays. 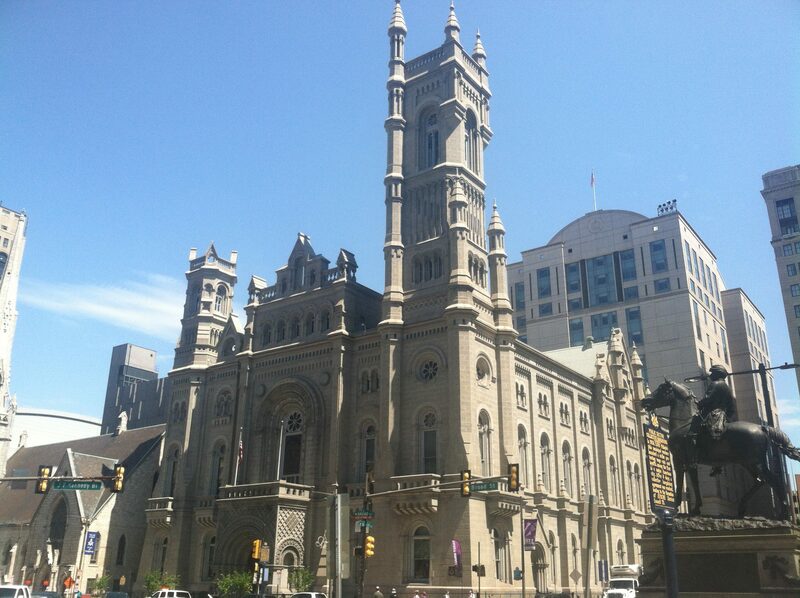 The Masonic Temple is an architectural gem that is quite possibly the greatest building in Philadelphia. Situated across from City Hall, it’s ornate facade is eye-catching, even given its surroundings. Above the facade, with its intricate carvings and stained glass window, is a massive spire, 250 feet tall. It is considered one of the wonders of the Masonic world, and continues to hold meetings for members of both Freemasonry and the Order of the Eastern Star. Upon entering the Temple, visitors are greeted by a massive hallway, leading towards the central staircase. Overhead is a ceiling fresco depicting figures symbolizing Masonic virtues. Throughout the Temple, there are all sorts of artworks, many of which carry symbolism alluding to the ancient world, Masonic values, and people in freemasonry. Visitors are lead to the museum, a small room with Masonic artifacts, as they await their tour. The tour covers the seven lodge rooms in the Temple, all named for a different style of architecture. The first is Oriental Hall, modeled on a court from the Alhambra Palace in Spain. The second is Gothic Hall, with the Master Mason’s seat modeled after the throne of the Archbishop of Canterbury. This room has wooden furniture and a gabled ceiling. On the second floor, Ionic Hall is a classically designed room with portraits of Masons past along the walls. Egyptian Hall is one of the most unique rooms in the city, modeled after the Temple of Luxor. It has paintings in the style of those of Ancient Egypt, and Pharoah heads as the tops of the columns. Norman Hall has elements of Romanesque architecture, and the Seal of Solomon, known by most as the Star of David, is a motif. 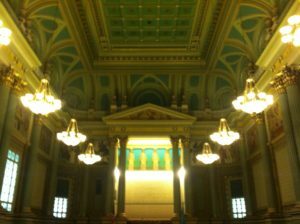 The Temple has two large rooms, Renaissance and Corinthian Halls. The former has stained glass, elaborate columns and moldings, and murals of Joshua and John the Evangelist facing each other. The shape of the Seal of Solomon is in the center of the ceiling, where various geometric shapes surround it. Corinthian Hall is the largest, seating 400. It is modeled on Greek architecture, and has Latin inscriptions, murals of Greek Mythology, an exquisitely detailed ceiling, and an impressive portico over the east side, with “fiat lux” (let there be light) inscribed over it. Some of the most memorable parts of the Temple are the hallways and staircases. The first floor hallway has a row of portraits of Masons past along the walls, with two doors leading to the central staircase. On the second floor, the grand staircase leads to a space with busts of Franklin and Stephen Girard. One of Gilbert Stuart’s famed Lansdowne Portraits hangs in this room. The stained glass window, visible from the outside, depicts Moses and the Burning Bush. The second floor corridor has the same arrangement of portraits as the first, but the lights shut off to reveal a ceiling design that mirrors a starry sky. The central staircase goes from the basement (not accessible to visitors) to the 3rd floor, with stairs facing west on one floor and two facing east on the next. It leads to a very satisfying design, with the door to Gothic Hall at the top of the stairs. From the third floor, epic murals of ancient life in Greece, Egypt, and Mesopotamia are visible. They are massive and intricate, and continue the theme of ancient life found throughout the Temple. On the first floor, the Benjamin Franklin room is a small room with paintings of Masonic life, a richly decorated ceiling, and a picture of the current Master Mason. The tour begins and ends at the Masonic Museum, which is on the first floor near Oriental Hall. Many of the most important figures in American history, including George Washington and Benjamin Franklin, were Masons. A collection of prints, drawings, artifacts, and pictures tell of Freemasonry and the people who have joined it. The most memorable item is a piece of Washington’s coffin. His body was eventually moved to a sarcophagus, where it is interred at Mount Vernon in Virginia. His Masonic apron, which he wore when laying the cornerstone of the Capitol Building is also on display. Another notable item is a model of the Temple of Solomon in Jerusalem, which was destroyed during the Roman invasion of Judea around 80 AD. Admission is $13 for adults, $5 for children, $7 for seniors, and free for masons and military. There may not be tours on days when Masonic meetings are held. It is recommended that you call in advance.